For more than twenty years, J. Brown has been developing techniques to teach people how to practice yoga in a deeper and more fulfilling way. He is also a well-known writer and podcaster, having been featured in Yoga Therapy Today, the International Journal of Yoga Therapy, and across the yoga blogosphere. 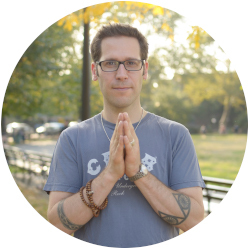 His podcast has become the premier resource for yoga teachers and center owners. J. Brown came to yoga by way of his mother’s death. Reconciling that loss, and wanting to be free from the crippling grief and disillusionment that came with it, fuelled his passion for learning to make himself well. First, he gravitated towards an Ashtanga, power vinyasa style. The intensity suited his struggling temperament. After sustaining several injuries, he explored an Iyengar based approach to learn better alignment. But he soon discovered that better alignment alone was not the answer. Despite having achieved proficiency in both the Ashtanga and Iyengar styles, studying with renowned teachers such as Alison West and Richard Freeman, J admits: ‘I still had chronic pain and was horribly disillusioned and unhappy.’ The next phase of his search would be in India. In Rishikesh, J. found a rare and special teacher in Swami P. Saraswati. He taught J that yoga practice was not a linear progression towards some unknown thing, but rather a process of learning how to take care of yourself. Back in NY, J. stopped going to regular group classes and devoted himself to a self-practice, ultimately meeting one his most influential teachers Mark Whitwell and finding his way to an entirely therapeutic orientation inspired by the TKV Desikachar/Krishnamacharya tradition. In 2007, after more than a decade as a popular teacher at various schools in Manhattan and Brooklyn, J. founded Abhyasa Yoga Center in Brooklyn, NY to provide a home for yoga practice that adapts to individual needs. In 2017, J closed the center to travel, write, and talk about the important issues and focus on his work changing the dialogue and direction of yoga practice in the west.